Come January 1, 2013, taxes will go up on everyone. The President wants this because he a) will have more money, as he claims, to spend on government programs, and b) can blame it on Republicans. The President's (and the Democrat's) position cannot be clearer: more spending, stimulus, and taxes, and a permanent removal of the debt ceiling limit. The Republicans are not much better. They are willing to concede most of these things if the tax increases can be disguised as closing deduction loopholes. When Congress compromises and regardless of how it is spun, the result will be higher taxes for most Americans, fewer jobs, and lower growth and GDP, yielding fewer tax payers and higher debt. The right thing to do for the country is to extend the Bush tax cuts for all and to do no stimulus spending. The debate over who is rich and how much they should or should not pay in taxes is political posturing for idiots. The extra revenue from these higher rates will do little to address the deficit. 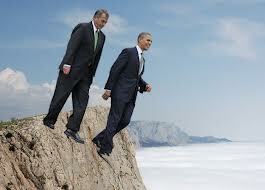 The fiscal cliff debate is the same old argument just with new words. The Democrats want bigger government -- more taxes and programs to enslave the masses. The Republicans are unable to build a compelling and understandable case for smaller government because they are not committed to the premise. Politicians do not get elected or re-elected, so they think, by shrinking government, rathering by showing their constituencies they did "x" and "y" for their state or district. Obama will get his recession and he and the media will have success in blaming the Republicans for their desire to protect the most wealthy. Few mention the elephant in the room: government is too big and individuals and corporations are taxed too high.